Repair unrecognized or corrupted Kingmax USB flash disk that have format errors .Super Stick Recovery Tool V1.0.2.19 can fix and update UT161, UT163, UT165 flash controller firmware . 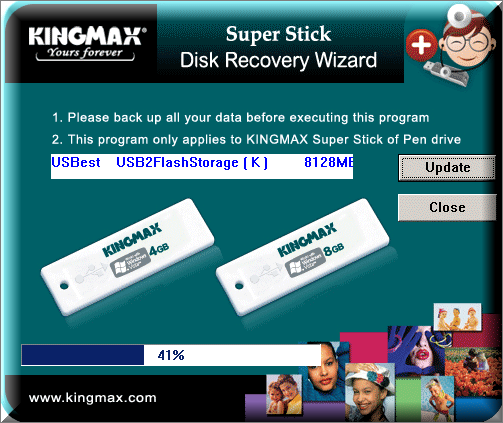 Kingmax Super Stick Recovery Tool V1.0.2.19 is designed to repair and reformat corrupted Kingmax flash drives that have format problems such as Write protection errors , windows unable to format your flash drive ,Please insert disk error message and more format issues . Super Stick Recovery Tool V1.0.2.1 support repairing flash drives that have the following Flash chips " UT161, UT163, UT165 " also can reformat Kingmax flash disk .Please don't use this software with other flash drive chip controllers .You must determine your flash drive chip vendor first ,You can use Chipgenius software or USBDeview V2.30 utility. How to format Kingmax usb flash disk ? Download Kingmax Super Stick Recovery Tool V1.0.2.19.rar from download links below . Insert corrupted Kingmax USB flash disk to your computer . Extract Kingmax Super Stick Recovery Tool V1.0.2.19.rar zipped folder , then open Super Stick Recovery Tool V1.0.2.19.exe . If your flash drive is supported by software , you will see flash info appears . Click Update to begin reformatting flash drive . Wait until finish format process . Thanks a lot for uploading the software. It has worked just fine and now my broken usb stick works again.